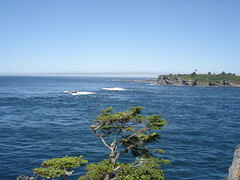 My wife, a good friend, and I just returned from a brief birding get-away to Cape Flattery, where we literally stood on the northwest tip of the continental US, looking out west into the vast Pacific Ocean. We were lucky enough to see tufted puffins, nesting murres and pelagic cormorants, a sea and river otter, oyster catchers - and a host of other fabulous living things, perched a hundred feet or so above the crashing waves. It was take your breath away fabulous. 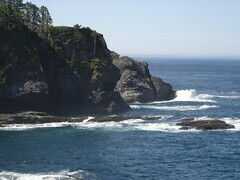 Looking out past Tatoosh Island and all the nesting birds so close to, and yet so far away from the mainland was amazing. I felt hopeful again. I got to take a breath, maybe regain my long term perspective. I've been struggling with this need to write about my hurdles from this past year using technology in my classroom. I have not tried yet, because the wounds and anger are still too deep and fresh. I think I can now - soon, anyway.